Keep calm-it’s just an extra chromosome. If you have recently been blessed with the arrival of a beautiful baby and that baby happens to have Down syndrome, and you are looking for assurances that everything will be ok, I hope this blog can convince you not to worry too much. Of course, who knows what the future holds but having a child with Down syndrome is one thing not to fret about! The first thing I would advise new parents of these wonderful babies would be to give yourself enough time to fully process this. Very soon after Mini’s birth, we were given a whole plethora of pamphlets designed to help but which I just wasn’t ready to deal with. Know that any thoughts you may be having, however dark, are your mind’s way of healing and don’t be afraid by them as these are necessary on your path to the acceptance of this particular card that fate has dealt you. Chances are they’ve been all thought before by those of us with minis with Down Syndrome. Know that the information and advice from support groups such Parent Link which operates under Down Syndrome Ireland are all there for you when you’re ready to accept them. Something my dad declared in the early days after Mini’s birth when it was all just a bit too raw was something that really resonated with me. It was after Ireland had defeated England in the final match of the Six Nations and the Guinness was flowing at our house which led my dad to turn to me and utter these immortal words-“Stuff the chromosomes.I think she’s going to be fine.” Now, I’m paraphrasing slightly as the one of the words he actually used is not really mini friendly so I’m not going to use it here but I think you get the idea. And he was so right. There are 46 other chromosomes at play, working to create the truly unique mini who is your son or daughter. Down Syndrome is just one aspect to this little person, it does not define them!It’s completely natural for parents to agonise over the future of their minis and this is especially true for those parents whose minis have special needs. You can imagine the worst possible scenario but the reality is it’s much too early to predict how much difficulty your child will have. It may be much less than you thought. That’s not to say that there won’t be challenging times ahead, but people with Down Syndrome are now living more exciting, rich and diverse lives than ever thought possible. The future’s bright! !It goes without saying too-enjoy your little one! Try not to get too bogged down with negative stories. Smile,laugh,be silly and really maximise this special time you have with them because believe me, it will go fast and once its gone, its gone forever. The following information is primarily for Irish families who have received a prenatal diagnosis of Down syndrome or have recently given birth to a child with Down syndrome. If you are living outside of Ireland and you have some information which you feel would benefit those living in your country, please contact me and I will be more than happy to share it here.Or if you’d like to contact me for advice or a bit of a chat, please don’t hesitate. I’m by no means an expert, but I’d like to think that after 4 years I’ve learned a thing or two about raising a child with special needs. There is fantastic support from Down Syndrome Ireland who have local resource groups around the country. They have a help line, 1890 374 374 which is open Monday to Friday 9:30-5:00. There is also the Down Syndrome Centre, who are based in Dublin. They hold regular seminars and workshops designed to educate and aid parents and carers. For our UK readers, this explanation of Occupational Therapy and its many benefits for those with Down Syndrome from The Therapy Directory is very helpful. There are a number of things your family could be entitled to that may help to ease the financial burden if you are contemplating taking some time off work to provide extra care for your little one. There is also an option for one parent to get extra tax credits. This can be done by applying for an “incapacitated child credit”. I hate the title but it has made a difference to the Frenchman’s weekly take home pay. All things tax related bamboozle me so I’ll just say you can find all the information and relevant forms here. The tax credit will be backdated to the date of birth of your child. If your child has turned 3 and not yet potty trained, you should be entitled to free nappies from the HSE. Your public health nurse will be able to advise you of how to apply for this. One of the sites I recommend is yomammamamma.blogspot.com which is a great source of tips and support. 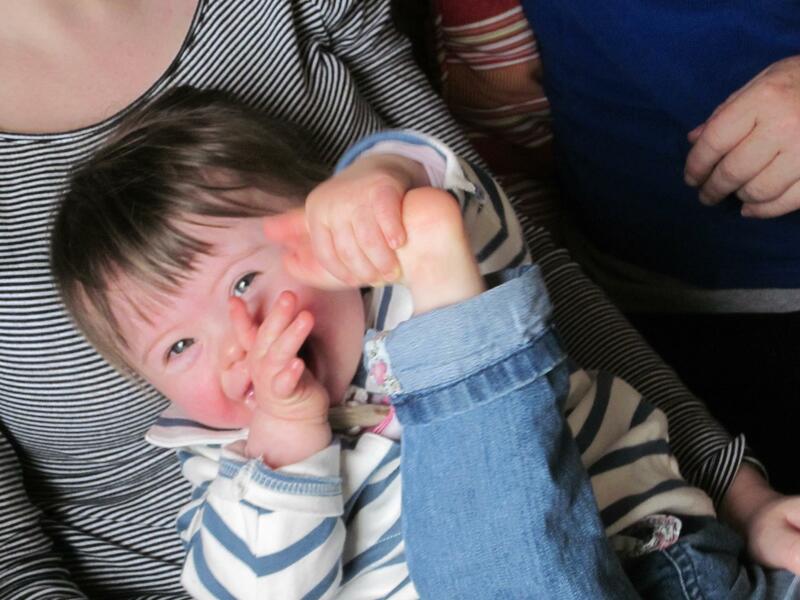 There are also a few baby groups dealing specifically with Down Syndrome on babycentre.co.uk and on the U.S. site babycenter.com.